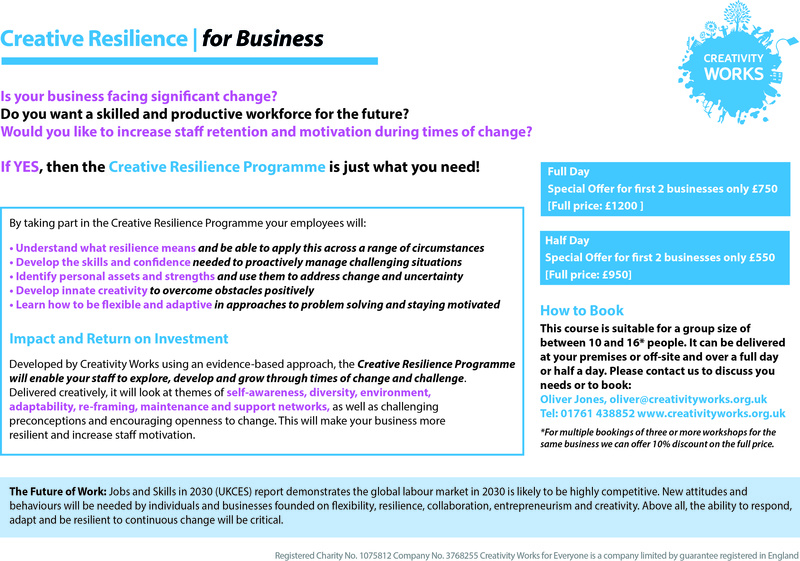 Creativity Works is looking for small to medium sized businesses to take part in a pilot of their brand-new Creative Resilience Programme (CRP). If your business is facing significant change, you want a skilled and productive workforce for the future and would like to increase staff retention and motivation, this programme is just what you need. We’ll help you to explore, develop and grow and we’re offering up to 40% discount for the first two businesses to sign up for the pilot by 31st January 2019! 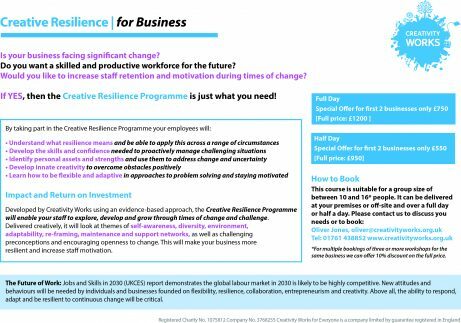 Creativity Works, a registered charity, has developed this programme to work with and support the needs of SMEs in the area. By investing in this programme businesses and staff will be ready to adapt to change, collaborate and offer new ideas to overcome barriers. The course is suitable for a group size of between 10 and 16 people. It can be delivered at your premises or off-site and over a full day or half a day. The Future of Work: Jobs and Skills in 2030 (UKCES) report demonstrates the global labour market in 2030 is likely to be highly competitive. New attitudes and behaviours will be needed by individuals and businesses, founded on flexibility, resilience, collaboration, entrepreneurism and creativity. Above all, the ability to respond, adapt and be resilient to continuous change will be critical.